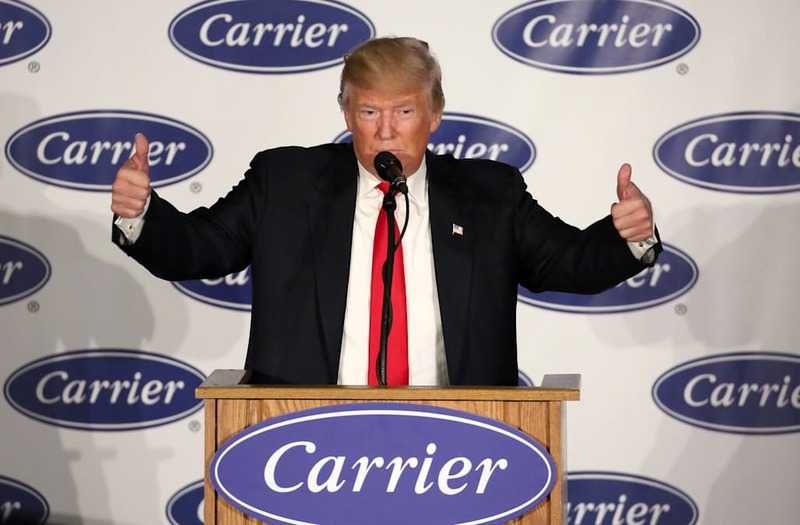 President-elect Donald Trump warned at Carrier's Indiana plant on Thursday that US-based corporations would not be able to outsource their jobs to other countries without facing ramifications under his administration. "Companies are not going to leave the United States anymore without consequences," Trump said before workers assembled at the Indianapolis plant. "Not going to happen. It's not going to happen, I'll tell you right now," he added. United Technologies CEO Gregory Hayes announced on Thursday that Carrier would keep approximately 1,100 jobs in Indianapolis after talking with the incoming administration and receiving a $7 million incentive package. The air-conditioning manufacturer previously planned to move 2,000 jobs out of the country — some of those will still be outsourced. But moving forward, Trump said "one of the things we are doing to keep" companies in the US is lowering the corporate tax from 35% to 15%. "It's terrible for business," Trump said of the current tax rate. The president-elect added that his administration would aim to reduce regulations placed on businesses. The speech was Trump's first since declaring victory on election night. While much of his remarks were focused on the Carrier deal, the speech featured many of the hallmarks of the real-estate mogul's campaign rallies. Trump re-litigated the Indiana Republican primary from May, noting he handily won the state once considered to be a "firewall" for Never Trump forces. The president-elect also praised retired basketball coach Bob Knight and continued to hammer the media, particularly zeroing in on the nightly news. "I don't like them, even a little bit," Trump said. The speech, part of Trump's nationwide "Thank You Tour," came after the president-elect toured the Carrier factory for approximately 45 minutes. Trump is scheduled to speak next at an Ohio rally Thursday evening.